Want to add some serious pizzazz to your favorite meals this summer? Next time you barbecue steaks, fish or chicken, how about serving Gazpacho Rojo-a chilled vegetable soup that celebrates Mexico's Spanish heritage? Or perhaps you'll be more inspired by its lighter, white cousin-Gazpacho Blanco. You'll win rave reviews with both of these. 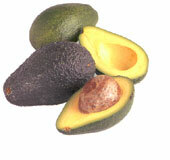 Or you could opt to serve refreshing, tropical Cantaloupe Soup Cancun or the richly sophisticated Avocado Soup. For some new, innovative salads, try out my Jicama Pico de Gallo, Molded Gazpacho Salad or Summer Nopales Salad. Any of these will surely liven up your family's all-time favorite meals and lend them a new, subtly Mexican flair. All recipes are easy to prepare and guaranteed to tickle even the most discriminating taste buds! This rich and delicious soup combines the traditional with the unexpected. It is an easy-to-make chilled soup that looks (and tastes) wonderful served in glass bowls on a hot summer night. Originally inspired by my cousin Susan's cruise down the Mexican Riviera, I've tinkered with it over the years and recreated it into something a little less exotic and a little more down-to-earth. This soup can be dinner party fare, beach picnic fare or just good eating in the backyard! Serves six to eight and only takes about 25 minutes to make. Puree avocado in food processor with chicken bouillon. Season with pepper. Gradually stir in whipping cream. Chill. Add cognac and sherry immediately prior to serving. 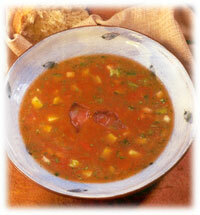 Gazpacho Rojo has been one of my all-time favorite summer soups since I first tried it in Madrid, Spain in 1967. It honors Mexico's Spanish roots in a sophisticated, delightful way. Served chilled, it's a delicious, healthy accompaniment to a summer luncheon or outdoor barbecue. And it tastes way, way better than you'd expect! Try it. You too will be hooked! This recipe serves six and takes about an hour to prepare. Puree first eight ingredients in blender. Remove from blender and put in very large bowl. Mix remaining ingredients in the blender. Combine with first ingredients in bowl and stir well. Empty into quart jars and refrigerate at least two hours. This can be kept in the refrigerator for several days. The flavor actually improves with age! To serve, place a cup of chilled Gazpacho in each of six bowls. In separate small serving bowls, place the diced egg, croutons, diced bell pepper, cucumber and chives. Watch your guests serve themselves, spooning a bit of each condiment onto the top of their Gazpacho. Then sit back and smile politely as they rave about your culinary expertise! Gazpacho Blanco is a less robust, more upscale version of the original. It's every bit as yummy as the original red gazpacho-just different. Try it with seafood or chicken dishes, or serve with any light summer meal. It is guaranteed to make you feel somewhere between down home barefootin' it in blue jeans and evening dress sophisticated-depending on which direction your mood leads you! This serves six and takes about 25 minutes to prepare. Puree cucumber, garlic and one cup of chicken broth in blender. Remove from blender and place in large bowl. Puree remaining broth, sour cream, yogurt, wine, salt and pepper. Mix thoroughly with other ingredients in bowl. Empty into quart jars and refrigerate at least two hours. This can be kept in the refrigerator for several days. The flavor actually improves with age! To serve, place a cup of chilled Gazpacho in each of six bowls. In separate small serving bowls, place the diced tomatoes, green onions, parsley and slivered almonds. Just as you did with the original Gazpacho Rojo, watch your guests serve themselves, spooning a bit of each condiment onto the top of their soup. Then sit back (one more time) and grin up a storm as they applaud your culinary expertise! Cancun is Mexico's most visited resort. Located on the Yucatan peninsula, it's one of the most-photographed spots in all of Mexico, and justly so. Its pristine white crescent sand beaches are surrounded by pristine, the breath-takingly beautiful aquamarine waters of the Caribbean Sea. This soup originated there. The combination of cantaloupe and potato gives it a wonderfully rich flavor and texture. Serve it outdoors this summer and you'll be able to imagine yourself dining al fresco-under a palapa-beachside in Cancun or somewhere equally as magical on the Riviera Maya. Even if you can't be there, you're still guaranteed to get a flock of compliments. Serves six and takes about 45 minutes to prepare. nutmeg and lime slices for garnish Place the half and half, potato and cantaloupe in blender. Puree. Stir in sherry and season to taste with salt. Serve chilled in glass bowls, garnished with nutmeg and lime slices. Pico de Gallo (pronounced GUY-yo) is half salsa and half salad. What makes this recipe unique is the jicama (pronounced hee-kuh-MUH), a delicious and crunchy root vegetable popular all over Mexico. Served on a bed of lettuce, this side dish is great with Fajitas or most chicken and fish entrees. It's a Mexican traveler's dream because all the ingredients can be purchased fresh at any roadside fruter�a. Serves six to eight and takes approximately 20 minutes to prepare. Combine jicama, peppers, radishes, onion and cucumber. Mix together oil, vinegar and oregano. Pour over vegetables and mix lightly. Add salt and pepper. Toss gently and serve on chilled plates. This recipe is a favorite of my mother's. It's an exotic salad with a Spanish heritage. Molded Gazpacho Salad is simple to prepare, but delectable -- and elegant enough to grace the table any ladies' luncheon in Beverly Hills or La Jolla. Or perhaps, like me, you'd rather be sitting on the terrace of a remote Baja resort like Punta Pescadero on the East Cape between La Paz and Los Cabos watching the iguanas playing and sunbathing on the rocks leading down to the beach. Either way, you will enjoy this exquisite salad. It's fat-free and serves eight. Soften gelatin in 1/4 cup warmed tomato juice. Heat remaining juice until almost boiling. Add gelatin mixture and stir until dissolved. Add wine, vegetables and seasoning. Pour into a one quart mold. Chill overnight. Unmold on a platter lined with romaine leaves. 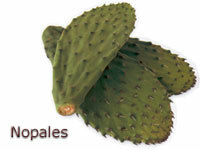 You can pick the nopales (tender, young prickly pear shoots) yourself in early summer if you live in the southwest. Or, if you have a Hispanic market near your home, you can buy fresh nopales already cut and cleaned in the produce section � or buy them canned. Either way, you will be able to make this festive, original and surprisingly delicious salad for yourself. I know it sounds pretty weird to you, but it's vintage Mexico-so you have to try it! Serves six and takes about an hour to prepare if you use fresh nopales. About 20 minutes if you use canned. Put nopales in salad bowl with chopped onion, celery, cilantro and tomatoes. Toss with salad dressing and mozzarella cheese. Add salt and pepper to taste and chill. Immediately before serving, top with Parmesan cheese.